The Renault Clio is in the top position along with the class leaders. The Renault Clio comes with some smooth and flexible engines, and most Clio versions are really affordable to run. The touch-screen infotainment system which is fitted to the high-end models is packed with features and is easy to use, too. Which Clio are you going to lease today? We offer top quality Renault Clio from brand new, nearly new, slightly used or ex demo, whether you have good or poor credit rating, pay a low or no deposit. These Renault Clio can be leased or financed and come with a warranty, HPI checked and when contract hire leasing, include UK nationwide delivery and AA or RAC Roadside Assistance cover for peace of mind. 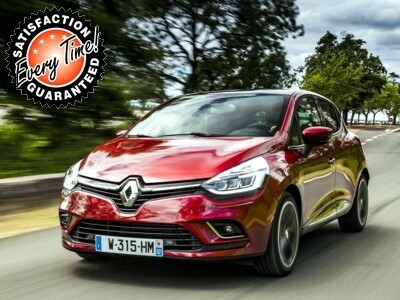 Time4Leasing can offer you the latest Renault Clio lease deals at lower prices because these vehicles are exclusive and offered at lower rates to customers that have good, poor or even bad credit history score ratings. The 1.5-litre diesel engine is definitely worth a look because it’s strong and smooth, but it’s also pricey, so we’d be tempted to stick with the 0.9-litre turbocharged petrol engine. Basic cars are reasonably well equipped, but you’ll need to trade up to Dynamique MediaNav trim to get the touch-screen infotainment pack. It’s worth paying the premium, though, as it’s an excellent system and gives the cabin a real lift. It’ll also add appeal, as well as value when you come to sell the car on. Beyond this, you can personalise your Clio to your heart’s content, thanks to no end of colour and trim combinations. A word of warning though; don’t go too crazy with your colour options, as a whacky scheme can have a seriously detrimental effect on your car’s resale value. There are 73 Renault Clio Lease Deals on Offer.